Ayurveda is known as traditional Indian medicine, which includes both proper diet in order to achieve balance in the body and good health. 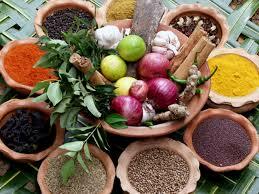 What is the nutrition point for Ayurveda? The point is fairly simple and is based on seasonal nutrition and the respect of certain rules during meals, such as combining foods or the proper intake of foods. During each season, one of the five elements, fire, earth, metal, water, or wood is ruled. If you follow the natural rhythm of changing elements in nature, you will create an internal balance and remain healthy at any seasons. Consuming seasonal foods is a great way to maintain the health and vitality of the body. Tomato, grapes, all vegetables and fruits have to be eaten in summer months, not in winter months. As we enter the season of the autumn, we must know that Ayurveda suggest a diet for Vata dosha, which calms, cools and signifies ease and mobility. Autumn is also an element of metal, and in accordance with this, foods that simbolize this element are used. What are the foods that balance Vata dosha ? The benefits of these foods will contribute to the enhancement of immunity in the autumn, reducing secretion of mucus in the bronchi, the appearance of allergies, clean digestion organs and preparing the body for the winter. What are the other nutrition principles for Ayurveda? In Indian cuisine, there are plenty of spices that are quite strong and stimulate stinging of stomach acid and digestive juices. This stimulates the first slaughter of the lungs, and then the stinging of stomach juices for digestion and normal digestion is ensured. Normal digestion is half the health and the basis of good immunity. When preparing a meal, we should be careful about which foods are allowed in Ayurveda because the correct combination of foods in the meal contributes to a better digestion. Say, you do not need to combine, meat and starch (rice, potato, bread), then do not use milk with veggies or hard-digesting foods with easily digestible foods. A very interesting issue in Ayurveda is that the meal starts with sweet treats, which is for some people a bit strange. But Ayurveda says that if the meal begins with sweet taste, it will activate kapha dosha and it will lead to better secretion of saliva, digestive juices and good digestion. The organism then prepares for taking other foods, which is, as a rule, a difficulty digested, such as meat. * Eat constantly at the same time and do not over eat. * Foodstuffs must be fresh and as good as possible. Avoid using cans, foods prepared in microwave ovens and reheated foods. * Drink some warm water before breakfast, as it helps digestion. * Lunch is the main daily meal and should be prepared only as much as it will eat. * The dinner should be easily digestible, for example, a vegetable soup, a lactic meal, such as a dessert, and should be eaten before 7 pm. For dinner you should avoid sausages, yellow and white cheese, salad, fruit, fatty and fried dishes. You should never eat directly before going to bed. * Do not eat too fast or too slow, and you need to chew food well. At the end of the meal, half of the stomach should be filled with solid food, a quarter of the liquid and a quarter should remain empty. * It is eaten only when the previous meal is completely warmer. Depending on the individual strength of each person's digestion, it is good to pass three to six hours between meals. During this period, you can drink fresh fruit or vegetable juice. * During the meal you can drink hot water. Avoid cold drinks during and after meals, because they make it difficult to digest. * It is not good to sleep after eating, but it is advisable to sit for 5 to 15 minutes in a comfortable armchair.